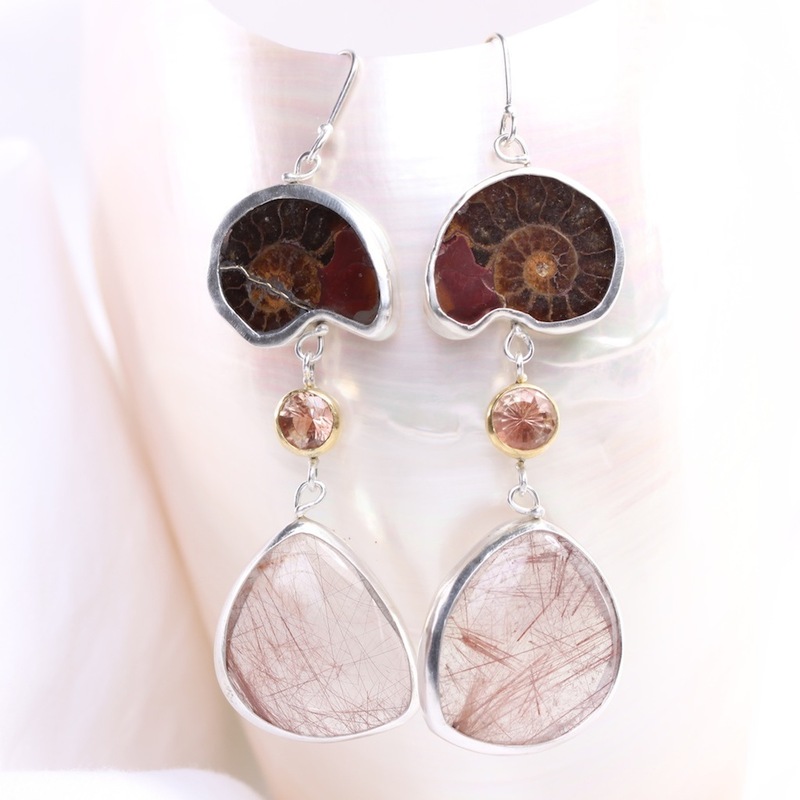 From the “Wanga” jewelry collection(Redhead Edition): Red rutilated quartz cabochons and Oregon sunstones dangle beneath agatized ammonites. 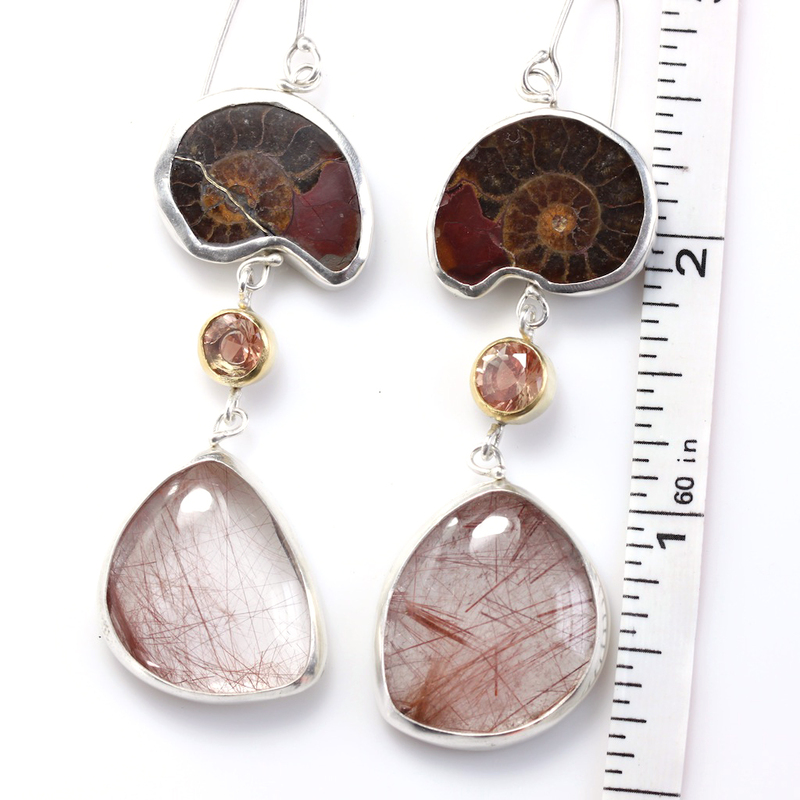 The ammonites and the rutile quartz are hand set in fine silver bezels with cut out sterling silver backs, the Oregon sunstones are hand set in 22K gold bezels with sterling silver cut out backs. Sterling silver wirework and handmade sterling silver earwires. 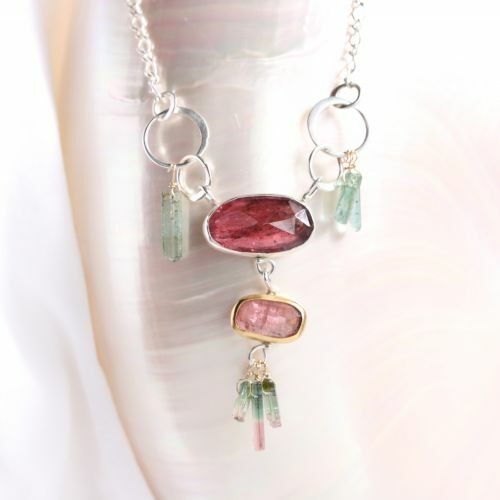 The rutilated cabs have beautifully defined red needles in a freeform shape, they were cut by a wonderful Russian lapidary artist especially for Leda Jewel Co. These deep red ammonite fossils are old and fragile, and one of the halves (on left in photos) had a fracture that cracked. It was “repaired” with 18K gold, inspired by the Japanese art of “Kintsugi”. Wanga talisman earrings not for the faint of heart! 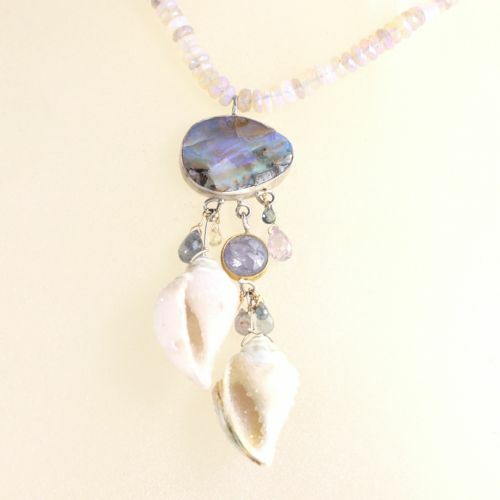 These seriously show stopping babies are about 3″ long, and have a little weight to them. Not recommended for sensitive or droopy earlobes. Just saying. (What? You can only wear gold in your sensitive ears? I can make and replace the earwires in 14K gold for $30, 18K for $50). 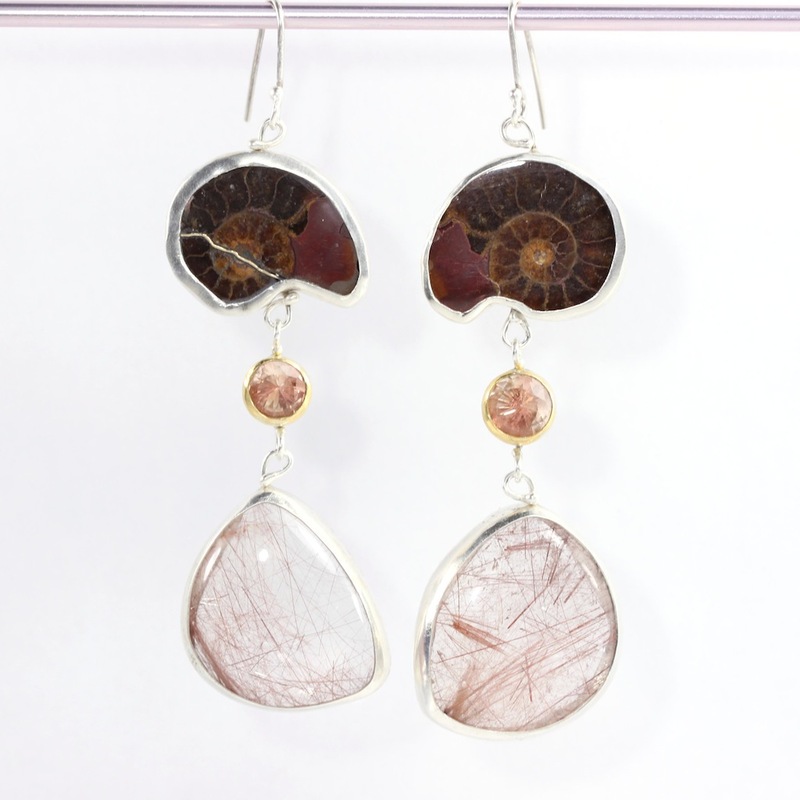 The Metalphysical Particulars: Ammonites symbolize the unending spiral of life and hold the power of wisdom, because these became agate, they have the added boost of strength and protection. 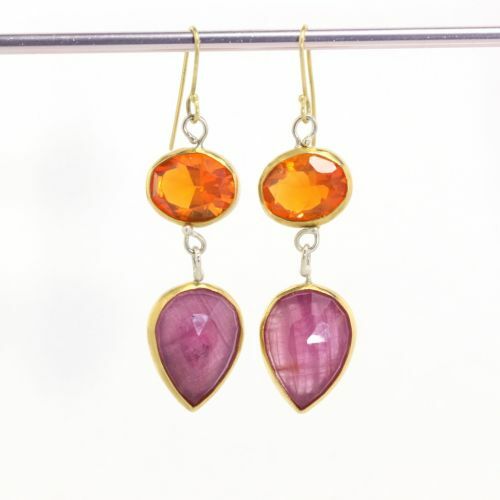 Sunstones symbolize life and vitality, they are healing, protective and bring success and self confidence. 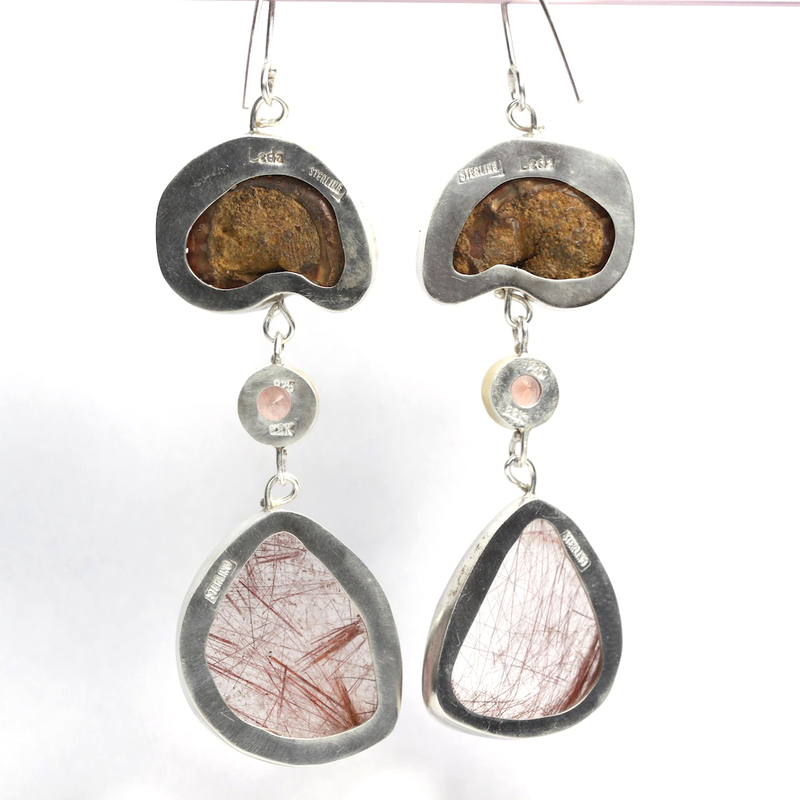 Rutile (or rutilated) quartz (which is also referred to as the “Venus Hair Stone”) symbolizes the “arrows of love”. 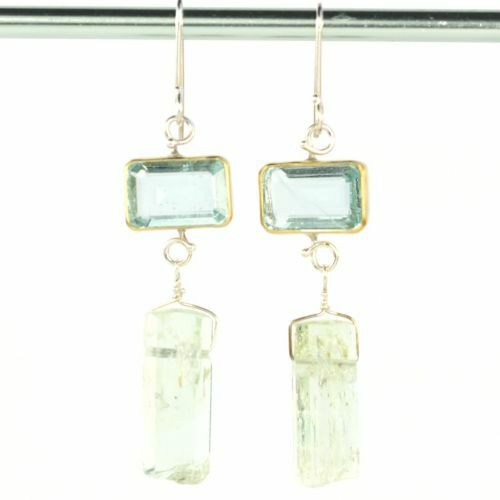 Rutile attracts love, and stabilizes relationships. Wisdom, protection, love AND success!